They make all sizes of toilets, sinks, and cabinets. Choose the smallest you can get your hands on. 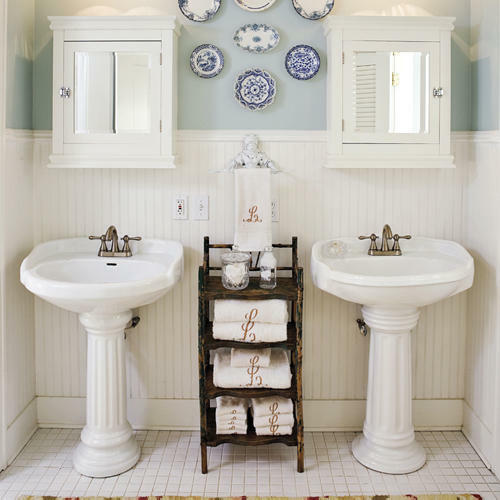 Choose a pedestal sink rather than a clunk vanity. Or if you can’t do without the underneath storage, choose a small vessel sink. Chose open shelving instead of a hulking hutch. The smaller your furniture, the bigger the room will feel. A dim bathroom will feel a lot small than it is. 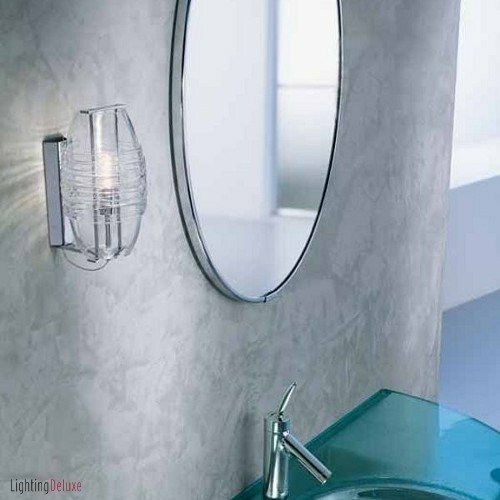 To make your small bathroom feel larger, invest in multifunctional lighting. Get dimmer switches and set up several kinds of lighting. Choose natural light bulb or LED lighting, which looks closer to the sunlight outside. If your bathroom has awkward nooks and crannies, light them up! Those nooks will join the regular square footage and make everything feel bigger. Also consider adding lighting on the sides of your vanity as well as above to light up the lower area more. Instead of cluttering the floor space with tiny cabinets, take a narrow shelf from floor to ceiling. You’ll elongate the space and create an illusion of stretching. The eye will go up rather than getting stuck on the ground. Also take advantage of the space about the doorway, where you can also place shelves that will not take up visual space in the bathroom. Instead of using a shower curtain, get a glass shower door instead. 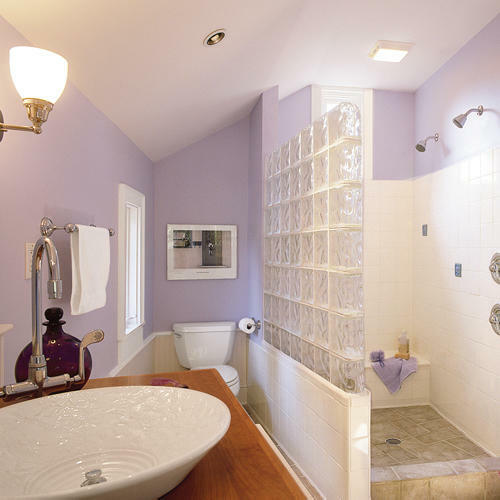 You’ll visually add the space of the shower to the space of the bathroom. 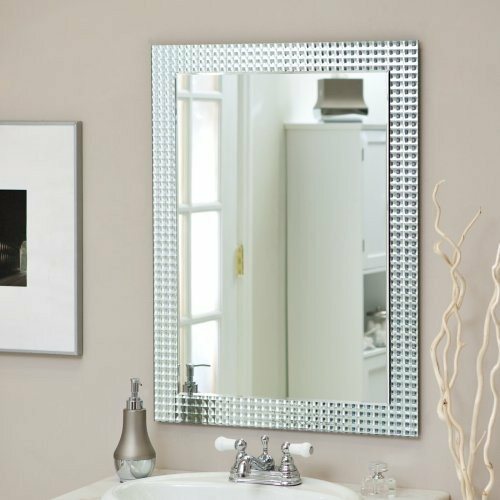 Use large mirrors to create more space and reflect the light. Strategically place mirrors across from doorways and windows in order to open up the space. Use a full-length horizontal mirror to widen the space, or if it’s height you need, choose vertical. If you have clunky cabinet pulls, consider switching them out for something smaller and more light reflective. 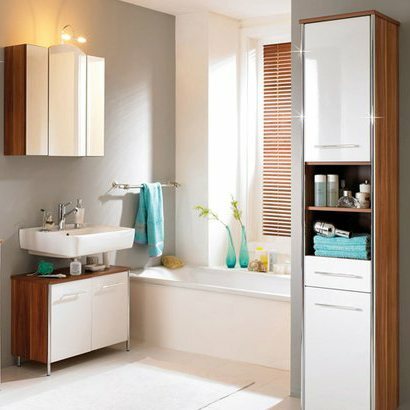 From your furniture to your paint, choose a lighter color scheme to give the bathroom a sense of space. Light colored wood reflects light and light paint opens up the room. Light wall colors such as pastels and off-whites reflect color and increase the room’s brightness. If you choose a pattern, choose one with a white base and a simple pattern. Now that you’ve addressed the floor space by going vertical, make sure that you’re also cutting out the general clutter of your bathroom. If you have bath toys, toiletries and other items out of place or piled up, your bathroom immediately gets smaller and more overwhelming. If you need more shelving, don’t be afraid to add it. Done well, the shelving will be more organized and give a sense of order and roominess that would be sacrificed to piles of things all over the floors. 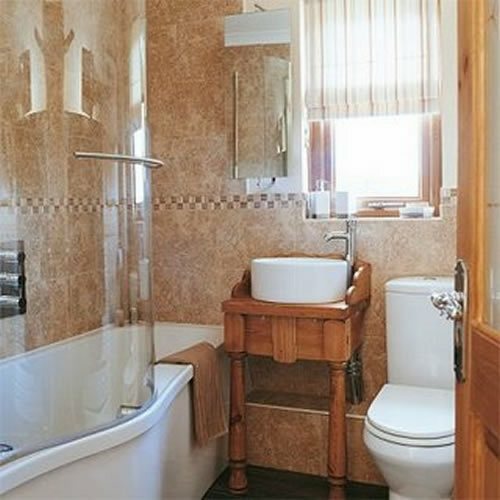 Your little bathroom can get a lot bigger if you pay attention to its design, lighting and decor. Simplify, go vertical and add the right light, and your bathroom will gain virtual square footage overnight.